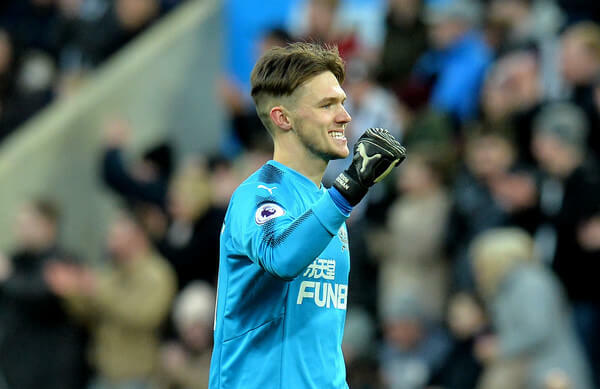 It was good to see Freddie Woodman finally make his debut yesterday in the 3-1 FA Cup win against Luton Town – he’s waited a long time for it. Freddie played OK, but there were a couple of moments early in the game when he delayed his clearance and could have had the team in a bit of trouble. Freddie looked what he is – a talented up and coming goalkeeper who lacks experience and needs first-team playing time. Hopefully, Freddie can get a loan deal set up for the rest of the season, but that will depend on whether Rafa can be successful in bringing in a senior goalkeeper to the club. If the manager cannot do that maybe it’s the FA Cup games, Freddie will play this season. His debut yesterday will do him a lot of good, and he will learn from the (minor) mistakes he made – like delaying his clearances in the first half. Woodman was exposed for the Luton goal when he came out, and goalscorer Hylton easily went around him before putting the ball into the back of the net. But it was shocking overall defending by Newcastle for that goal, and we cannot do that next Saturday against Swansea City – we were a bit sloppy in defense yesterday. Woodman is a top young professional who is determined to make it to the top at Newcastle. The 20-year-old needs time out on loan – and for next season he could be loaned out to a Championship club and play the whole season out on loan. He’s the most promising young player we have in the ranks at the moment. Who Was Newcastle's Best Player Against Luton? isn’t this what a lot on here have been saying for weeks people that have actually seen the lad play. Hello All (Happy New Year). Just had an update from my contact in Egypt he said his contact told him that they will start getting feedback on acceptance mid January. This would tie in with Shire’s new 7-10 day timeframe. It’s my birthday on Friday so hoping for a nice present!! Now I’m not sure if the acceptance is from Mike Ashley or acceptance of FA. I also asked who the backers were and he said his contact thinks hey are from UAE. Just giving feedback that I have received. For years we have mismanaged our youngsters through ignorance and poor coaching or on times, because of necessity due to our lack of numbers. If it is the Maktoums, it’ll be rather fun, as until just 35-40 years ago the two tribes (Maktoums of Dubai and the Al Nahyans of Abu Dhabi) were still at war – literally shooting each other down what is now the E11 – although at the time it was a sand track. Now they wage their wars and their one upmanship via proxy with dollars and who can piss the highest up the wall contests. PS, I still think MbS is more likely but who knows. Don’t know why Newcastle can’t come out and update the support – eg talks ongoing ? If any outfield player needs to go on loan it’s a keeper. No other way to displace the others unless you are seen to do the business in competition. Forster couldn’t get past Harper and Krul but going on loan changed all that. Hopefully though woodman would be able to leapfrog Elliot and Darlow more easily. He should have been sent out ages ago. My contact in Romford says it’s done. He drives a black cab and hears things. Guy with glasses and a brief case told him on Friday. The interview with the BBC is now this Saturday because Amanda ate a spicy curry on Friday night and had the trots all day Saturday. Apparently Shearer was furious. He’s the one interviewing her. Just passing on what I’ve been told. But if you can’t trust a black cab driver from Romford, Who can you trust ?? Because loose lips sink ships Frank. And nobody likes a grass. Sounds good to me, Belfast! Didn’t see the match yesterday, only saw highlights and reports. Quick skim on comments etc on here and on Twitter. Can’t believe woodman got a bit of stick. I know it’s only a minority but it’s disgraceful. Perez too. He was getting a bit of stick even though he scored 2 goals. Not sure if he continued from Stoke and played up front but it doesn’t surprise me. Yeah people can call them tap ins but not every striker sniffs these goals out and follows the shot at goal. Good qualities in a striker. Disclosure agreement. Will only know for sure if and when it gets done. If it fails will never find out because of disclosure agreement rumours will just fade away. So (i hope this not the case) that’s why no info coming out. Jack Butler I’ve read on here on a number of occasions that the club gets this seasons money in the summer ? So I don’t believe Mikey will be under more pressure to sell in the summer. Even if we do get relegated unfortunately. Problems for arsenal forest no 17 all over arsenals defence. Watched the game on NUFC.co.uk but sadly won’t get that time back. Unfortunately it was exactly what it should have been, a runout but no over-exertion, in fact we got so blasé we allowed them into the game but never any threat of giant killing or owt daft. Woodman was in danger of getting caught a few times and illustrated why he needs to get out of the stiffs asap. Hard to tell what was going on with the crowd but i suspect as many others do there was a high nugget count, transients and bored dad’s in there. I’m sure the players realised this as well and took it in their stride. Hard to fathom what’s going on with Ritchie I mean he was literally our man off what’s the craic with him? We keep being linked to ings and if I’m honest, that’s underwhelming. I never rated him before injury and tbh, not sure what he offers that gayle and Perez don’t offer. Especially in context of him likely needing a few weeks to gain sharpness. He’s a good cab driver Ron. Always taking shortcuts. Keith Bishop was in Romford on Friday!!!!!!!!!!!!!!!!!!!!!!!!!!!! Dunno why anybody bothers listening to the links to players. Every day it’s another one and every day it’s wrong. What was it in the summer? 200? Maybe slight exaggeration but you get my drift. Right now the potential signings are nobody, because Rafa doesn’t know if he has anything to spend. Even if he sells, that doesn’t mean he’ll get that money to strengthen. He made £40m profit last summer he’s yet to see. Best option is wait and see. On another subject it’ll be interesting to see if Ayew plays against us next week for Swansea. On first viewing it looks like a trip worthy of a yellow, but clearly he wasn’t punished for a yellow and technically the ref was right to red card him. An example would be Shelvey’s trip on Saturday. Deliberate and a yellow clearly, but I think Ayew was carded because he didn’t trip the lad, he kicked him, which is violent conduct. So, let’s see what the FA say about this one. Anthony Taylor likes to be central to any game, which is a shame because he’s a decent ref, but I think he got this one right. Swansea without Ayew has to be a better prospect than with him, as he is capable of the odd moment of magic. If the FA agree it was a kick and not just a trip – which imo it was, he misses games. Is Jens Lehmann Wenger’s bodyguard these days Jib? Cracking 2nd from Forest. That young un up front for them is a right handful. if we don’t get relegated the sale price will jump up significantly and we won’t be sold. if we are relegated he’ll wait till we are promoted rather than sell at a low amount. i think we will survive and in a couple of years time will be an established Premier league team under Rafa. i don’t think there will be a lot of transfer activity because Rafa has belief in his current squad and won’t want to make many changes so as not to disrupt things. i think he will be looking to add 1 or 2 carefully selected players with a view to building over several windows. I happen to know someone who works as legal counsel for the government of Dubai. He’s unaware of anyone from the UAE trying to buy nufc. That individual is from Newcastle and working out there so if he did know it was uae he’d be buzzing about it. I’ve pressed him on it a few times but all I get is it seems like Staveley with investors. Btw I’m in no way an ITK and believe the takeover will happen when we have ensured safety but this is one thing that seems like a given that UAE isn’t behind this move. Could be wrong though!! There wasnt exactly a queue around the block at the given price…. Jane, if we get relegated again Rafa will be gone and we’ll be down there a while imo. I don’t think Ashley is asking too much at 300 million quid if I’m honest. The potential is massive, it just takes somebody with the right mindset to reach that potential. I still fully expect this deal to happen. Ashley wants out, they want in. If they’re reluctant to spend another fifty million to seal the deal, then that might be a bit alarming for future player investment. All I ask for is an owner willing to speculate to accumulate. SJH did it and he took us to heights never witnessed before or since. He got his money back in the end and we had a great ride. My mum said she heard it from Micky Quinn (who insisted he hadn’t been flim flammed) that the deal is done. He heard it from an old wino on Northumberland street who got it from an assistant on W. H. Smiths lottery counter,who apparently has an ‘in’ (Adrian Durham) on Talksport. Apparently he made it up just to cause trouble!! Bobbybee @27 – I think it was Fer not Ayew but I get what you’re saying.